Beaver Creek in Colorado is part of Vail Resorts, and just a few miles beyond, but it is supremely special- a step above. Beaver Creek is posh, it feels almost private as you enter the welcome gate. Beaver Creek’s base is a beautiful pedestrian village, with luxury ski lodging including the centerpiece and ultimate place to stay – Park Hyatt Beaver Creek. There’s also a Westin and The Osprey. 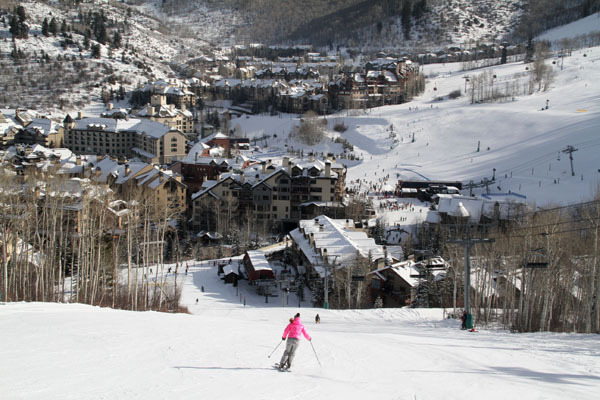 Beaver Creek gets 300 days of sunshine on its 1,832 ski-able acres. 10 high-speed quad chairlifts serve The Beav’s 3,340′ vertical and the terrain is extremely well groomed. The on mountain lodges at Beaver Creek are absolutely beautiful, including Red Tail Camp’s Talons and Spruce Saddle Lodge. Or request a seating at the semi-private Zach’s Cabin or Saddle Ridge for skit down service. Kids fortunate enough to ski Beaver Creek are treated like little royalty, right down to the ski in Candy Cabin and participating in the weekly Glowstick Ski parade. Parents can then enjoy beautiful ski runs on the Frontside – Centennial to the village is a classic, Rose Bowl gets more gritty with steeps and bumps, and Grouse Mountain offers long pitched untouched terrain. Finally Bachelor Gulch and Arrowhead to skiers’ left is an intermediate haven with long mellow trails leading to two more namesake base areas. You must ski to lunch at the Ritz Carlton Bachelor Gulch – this gorgeous Park-itecture log lodge is a sight to behold, even better stay and enjoy Buffalo’s chili or après ski of Champagne and the raw bar on the Mountainside Terrace. 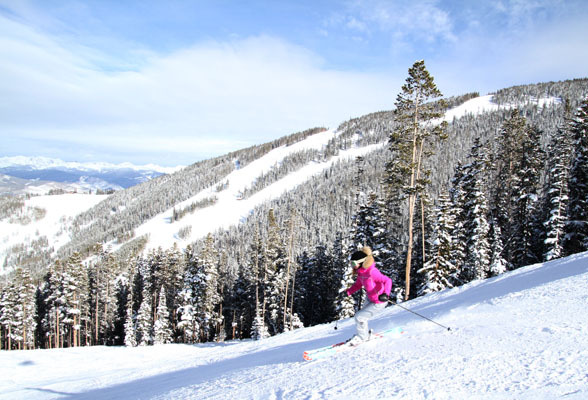 A must ski at Beaver Creek is the World Cup Birds of Prey downhill course from the 11,440′ summit. Beaver Creek is renowned for hosting the US Ski Team in November, often the World Cup season opener race. We’ve skied the Men’s Downhill Golden Eagle and Women’s Kestrel trails just after the World Alpine Championships here – this renowned race hill earns serious respect from racers around the globe- and us – for its super steep. Tree lovers will find lots of stashes at The Beav. Kids will love the terrain parks, and adventure zones- Jackrabbit Alley, Ripperoos retreat and Tombstone Territory. There truly is something for every skier at the Beav, even spa treatments and boutique shopping in the beautiful pedestrian village for the non-skiers. The Village at Beaver Creek is surrounded by luxe hotels. Our favorite – the Park Hyatt Beaver Creek – has a beautiful outdoor pool and the best 5 hot tubs in ski country, a grand Living Room lobby where cocoa and adult toddies are served at après ski, and a slope view patio with fire pits. Weekly torchlight parades on the slopes and ice skating on the centerpiece ice-rink are open to families in the evenings. 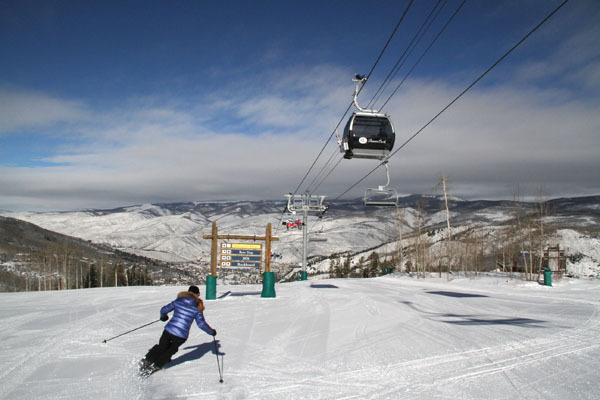 Below, connected by gondola is the town of Avon with more lodging at the Westin and dining in the Beaver Creek area, and Vail is just 20-minutes away on the same lift ticket. Families will love the supreme service at Beaver Creek including an excellent ski and snowboard school for kids and adults alike, fun activities on and off the slopes (ski the kids by the Candy Cabin), and of course there are the trademark free fresh baked cookies handed out in the village at the end of your big vertical day. With less skiers than Vail or Breck, plenty of white carpet grooming and white glove service, don’t overlook Beaver Creek on your family ski trip to Vail. 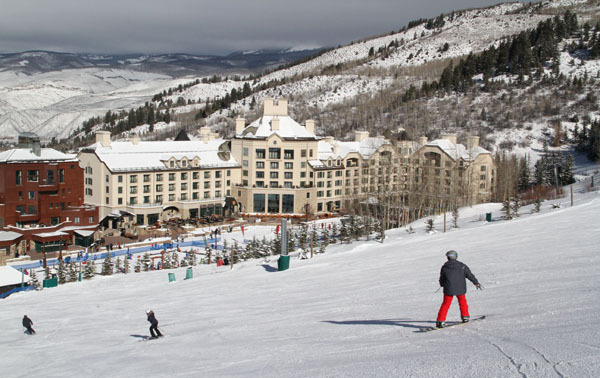 Beaver Creek is something special, on our Top Colorado Ski Resorts for a Family Ski Trip.